We are offering comfortable as well as clean and modern rooms with single baths in quiet location directly at the airport. Naturally our rooms are equipped with modern TV sets and WLAN access. Our hotel is just a 5 minute drive away from the airport. Rest prior to your travel in our modern and comfortable rooms. We indulge you with a delicious breakfast buffet the morning after. Based on our close proximity to the airport Hamburg the costs for a cab are very low, as well as travel time. Upon request we gladly call you a cab for a quick and effortless transfer. We are offering our guests with the 3 star+ HOTEL DENBU clean and modernly furnished rooms with WLAN and modern TV sets. The airport is a 5 minute drive away and even on foot accessible in only 15 to 20 minutes. Upon request we gladly call you a cab. 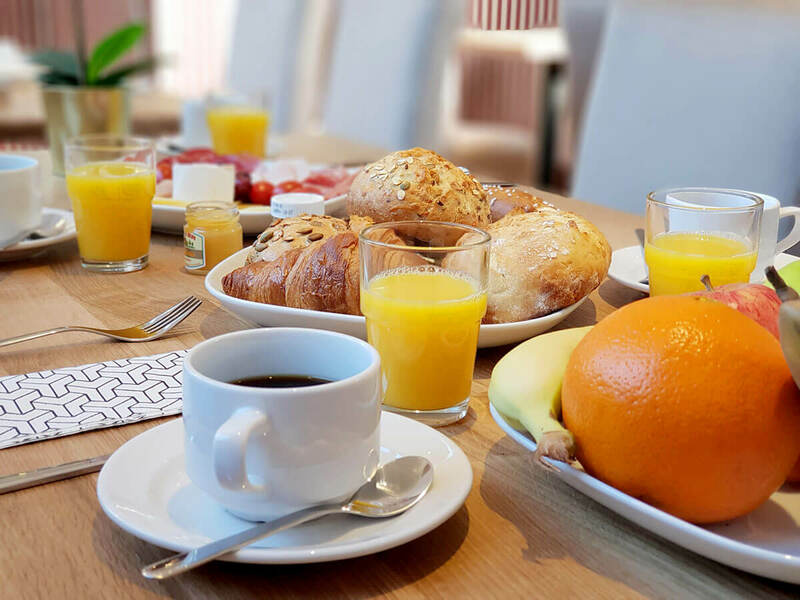 Start your day fresh and invigorated with our rich and tasty breakfast buffet, just before you continue your travel or explore the sights of Hamburg. Despite airport proximity, HOTEL DENBU offers a very quiet location as well as clean and modern rooms for a reasonable price.